Cochabamba (Agenzia Fides) - "Our mission and our only concern is to evangelize, faithfully fulfilling the Word of God, and to make known the principles and values of the Gospel, without other intentions or interests of any kind": this is what the Bishops of Bolivia in the message titled "I am the way, the truth and the life" (Jn 14: 6), traditionally addressed to the people of God, at the conclusion of the Plenary Assembly, held from 8 to 13 November in Cochabamba. Over 30 Bolivian Bishops dealt with pastoral, social and political questions. During the meeting the Governing Council of the CEB was ratified and the Bishops Presidents of the different Areas of the Bolivian Episcopal Conference were appointed (see Fides 9/11/2018). In the Message the Bishops confirm the task of "communicating the truth" and of realistically looking at the problems affecting reality. At this point they refer in particular to the "anticipated election campaign", in which false information, lies and calumny in the media seem to circulate, "in order to manipulate and influence public opinion, to achieve the objectives in a hidden way". The Bishops recall the words of Pope Francis, supporting a process of preparation for honest and transparent voting, "seeking the objectivity of facts, putting first the common good and what unites us, discarding everything that isolates, divides, contrasts and causes clashes, because truth springs from free relations among people, in respect, in mutual listening and in sincere dialogue". 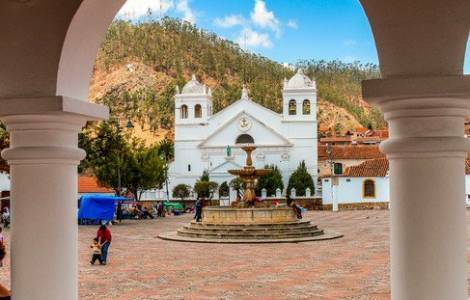 During the past year, the Bishops have highlighted events that encourage the Church, such as the 5th American Missionary Congress (CAM V), held in Santa Cruz de la Sierra, where the delegates of all the countries of the Americas met, "giving a great impulse to missionary vocation". "This gift - they say - is bearing fruit, giving rise to greater prophetic, missionary and reconciliation through the task of living in our local Churches the motto: The Gospel is joy, we must announce it".